Every bird like every human is an individual with individual likes and dislikes. Sharing my life with birds for over 20 years, I have found that when I have maintained these three steps I have been able to turn the most finicky birds into to bird toy players. I have found the best way to teach a bird to play with bird toys is to demonstrate how much fun their new is to play with by playing with it yourself. Birds are flock animals and in a human home you are their flock. Birds love to play with things that you are using like your pen or the telephone. This is because they see you do it and they feel it must be fun if all your attention is focused on writing or talking on the phone. Birds see our human nose as an equivalent to their bird beak, so what you want to do is ?beak? their new bird toy with your nose. Laugh and have fun while you are playing with it. Laughing and having fun is the key here. If all your attention is focused on their new bird toy then your bird will feel like they want to get in on the action. After all you?re having fun they want to have fun too. If you have another family member that is willing to help you with this then you can have them beak the toy with their nose as well with both of you taking turns ?beaking? and having fun. Over the years, my flock has varied in playing activity. 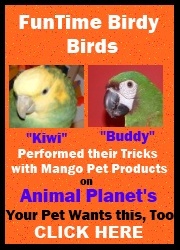 My Double Yellow Headed Amazon, Kiwi, is what I have termed the "Player". You can give Kiwi any toy and he will dive right in and play. However, my Cockatoo Marshmellow is what I have called the "Non Player". Marshmellow was always disinterested in playing with her bird toys. Marshmellow was my first challenge in learning to teach my birds to play. Marshmellow would chew wood but become bored very fast and just sit there. I realized that Marshmellow did not realize how to play with the other bird toys that I provided her with. I had a toy in her cage that had spinning molecules on an acrylic rod. I thought she would love to have fun spinning the molecules but she never played with it. That is when I realized she did not understand what to do. I took the toy out of her cage and started playing with it. I would twirl the molecules and make them spin with my nose while laughing and having fun. Within minutes, Marshmellow came over to me to see why I was having so much fun. Marshmellow then tried it for herself. She spun the molecule and ran away and them came back and spun it again. I encouraged her by laughing and in the moments that she walked away, I would spin it again myself. It then became a game that we could both play. I was then able to put the toy back in her cage and now she was having fun spinning the molecules all around by herself in her cage. I know what you are thinking, you feel kind of silly doing this. I had customer write me after trying this to tell me that he read what I wrote and figured he would give it a try though he did not believe it would work. He then went on to say ?I felt so foolish being a 30 year old man giggling and cooing while "beaking" a bird toy while his cockatiel looks on but this method really works!? He went on to say that ?within several minutes his Cockatiel was busy playing. ? This is very important. Just like humans not everyone likes the same flavor ice cream and not every bird will like the same type of bird toy. In fact, sometimes you may get on a chocolate ice cream kick and always have chocolate ice cream. Then one day you are just sick of it and don?t want it again for a while. This doesn?t mean you hate chocolate ice cream it just means you want a change. Birds can also be like that. They may love soft wood and then one day they just decide they are bored with soft wood and don?t want play with a soft wood bird toy for a while. You may be showing your bird how to play with a particular bird toy and he just doesn?t seem interested no matter how many times you try. This doesn?t mean your bird will never play or that he will never play with that particular toy. It simply means that at this point in time he may not want to play with a bird toy consisting of that texture. What you can do is try to peak his interest for a while and then maybe try with a different textured toy and come back to that toy at a different time. This is why it is very important to provide diversity with bird toys. When teaching my birds to play, I provide them with an assortment of different parrot toys consisting of different textures like soft wood, soft chewable plastic, leather and Supreme cotton rope for preening. Depending on their mood at the time they may like all of these toys or just one of these parrot toys. Most importantly when teaching your bird to play is to be patient and not give up. Some birds will get it right away and others will take time. I have found in life that I have a greater appreciation for the things I worked hard for more than I have for the things that came easy to me. Teaching your bird to play is no different. Being dedicated to your goal and finally achieving it has a greater reward for both you and your bird. I really cherish the time I spend teaching my birds to play with bird toys. The time I spend with them creates such a close bond of love and companionship. I really feel that this experience will bring you both closer together and create a deep bond of trust. So do not ever give up on your feathered friend learning to play. When it happens and it will eventually happen that feeling of satisfaction and love can match no other feeling in the world!